How far would you travel to watch your team play a league game? About 100 miles? 300? How about 5,500? Each way. Well that is the decision facing some Russian Premier League fans after SKA-Khabarovsk were promoted to the top flight for the first time in their history. Based about 15 miles from the Chinese border, Khabarovsk - who play at the Lenin Stadium - beat Orenburg on penalties in a promotion-relegation play-off to cause some major logistical headaches for next season. Khabarovsk is a seven-hour and 45-minute flight from the Russian capital Moscow and even further from St Petersburg. For those who can't fly, it's a four-and-a-half-day drive or five and a half days to the capital if you fancy the train(s). So for a round trip, you probably need to be booking two weeks off work. For comparison, the much-maligned Carlisle United to Plymouth Argyle trip in the English lower leagues is a six-hour drive each way - 5% of the travel time Khabarovsk fans - and visitors - face. 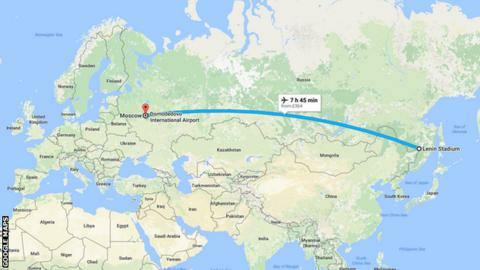 However, that's not the longest trip in world football. There are occasionally journeys of over 10,000 miles in the French Cup with teams from French-ruled New Caledonia and French Polynesia - to the east of Australia - both allowed into the tournament.